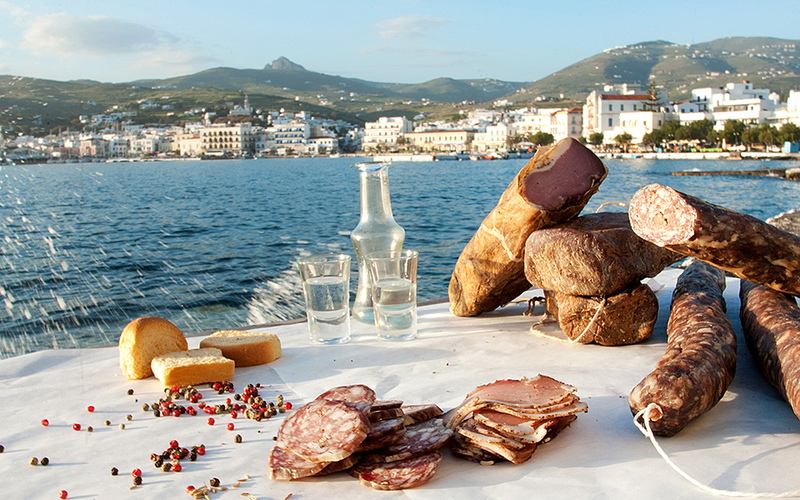 What we saw, what we learned and what we tried at the most delicious festival of the Cyclades. 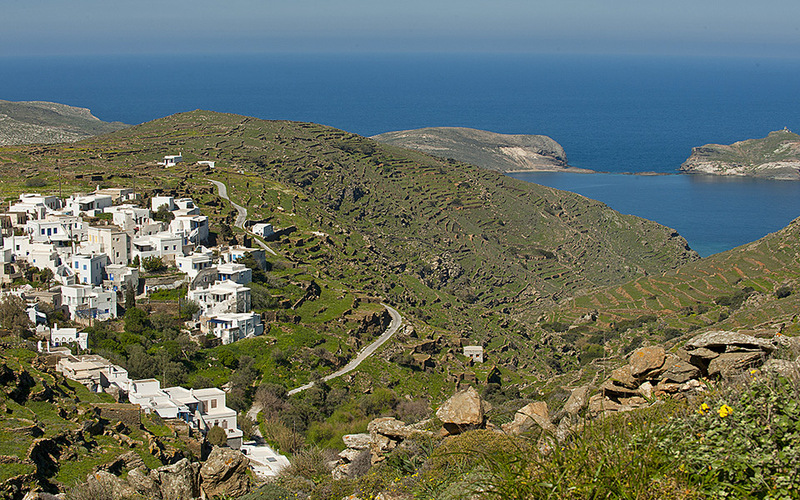 The medieval paths of Tinos exceed 400 kilometers. They cross every village of the island, and reach almost all its famous beaches. Walking along them is an excellent idea and a great way to discover the beauty of the island, crossing streams lined with trees, ancient stonework and old settlements. 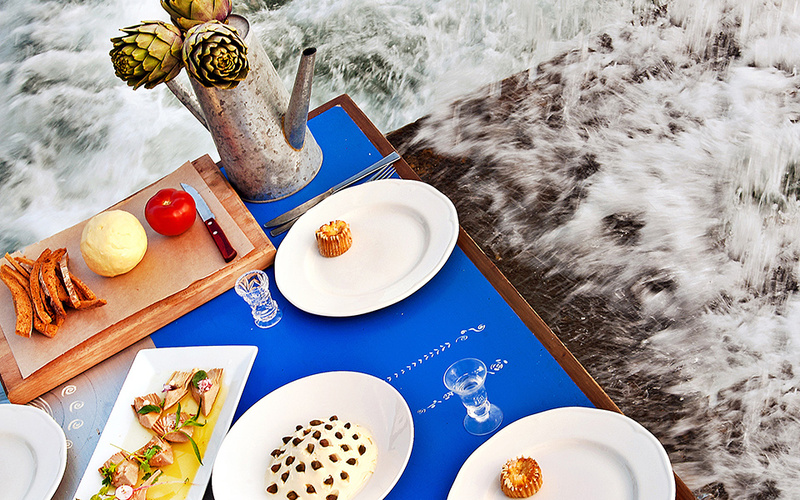 But equally endless and fascinating are the gourmet paths of Tinos. I walked them as a guest at the Tinos Food Paths festival, successfully organized in mid-April by a handful of restaurant operators and some outstanding chefs on the island. 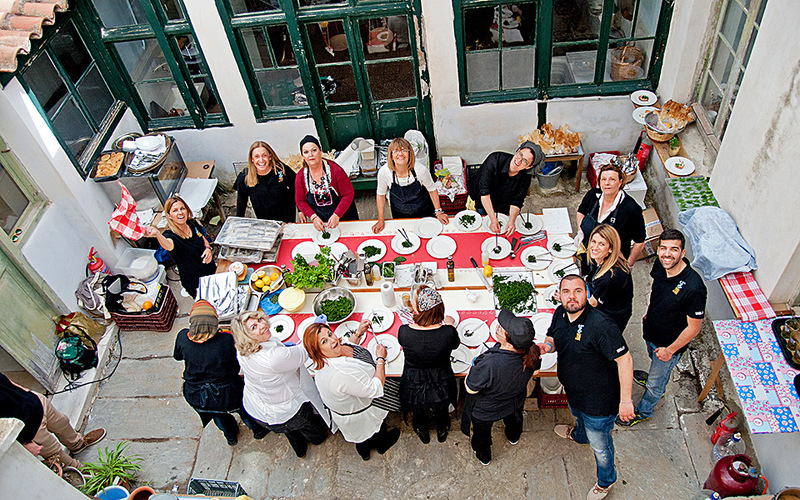 Tinos Food Paths is a gastronomic festival that was organized this year for the second year running. “It’s not just for our island, it’s a personal need, it’s not just a product for sale, it’s a journey and an experience, even for us,” say the organizers, and you know what? That’s exactly what those who were invited felt. The Tinians demonstrated their generosity and the desire for sharing. They told us their concerns and thoughts. They showed us what they make and shared the stage with amateurs. They fed us local delicacies, gourmet products and delicious dishes. They taught us how to love their blessed land. Several days later, the memory remains alive. Hospitality with a capital ‘H’, because the welcome the locals gave us was outstanding. But I didn’t just experience this in the context of the festival. In homes, taverns and in good restaurants we enjoyed visitor’s privileges, not necessarily with deluxe amenities and luxuries, but with authentic, genuine hospitality. Their menu captures their island in a real and rare way. The focus is on local produce, long before this concept became fashionable. The Tinians are productive. They farm, raise animals and fish. They always have. In recent years, they’ve become innovative: bread with anise, small Cycladic cheeses, local rusks, pungent kopanisti and Tinian gruyere, artichoke in vinaigrette, honey and bread and rustic local wines from Potamisia and Koumarianou. It’s hard to find the unique Tinian blue cheese, kariki, outside the island, nor the sweet, misshapen tomatoes, the asparagus or the jellies made by the local butchers on the island. Other inspiring flavors: Nissos beer from the Cyclades Microbrewery, wines from the local Assyrtiko, Mavrotragano and Avgoustiatis grape varieties of Tinian vineyards, the newly-cultivated Malagouzia of the Volacus winery, peppery gruyere cheese of the cheesemaker San Lorenzo, artichoke paté, artichokes with garlic, and other goodies from Doulapi tis Yiayias (Grandma’s pantry), along with wonderful handmade soaps made from Tinian raw materials by Ena Karo. 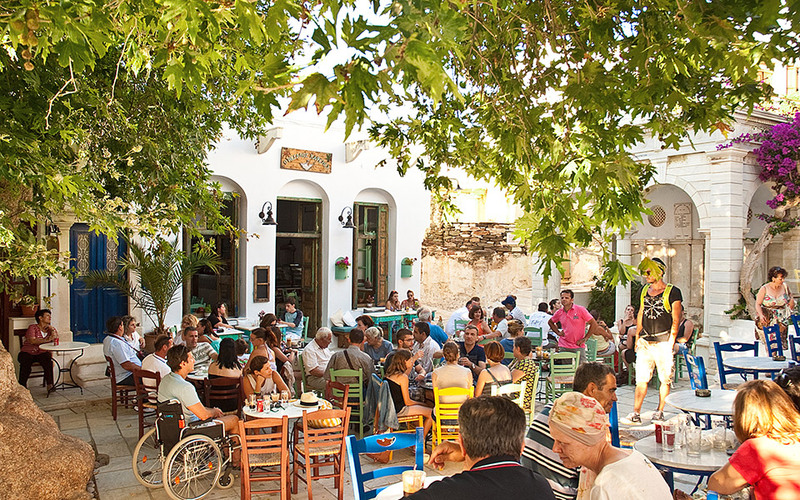 Whether the fanciest or humble, the restaurants of Tinos offer food cooked with soul. Their specialties? Froutalia (omelettes), fricassee with chicory, rustic hilopites pasta, fresh butter and tomato, and Tinian pseftomakaronada, with beans and grated local cheese. I also tried the local pigeon in red sauce, all sweetness and substance ‒ you might have to do a bit of searching to find a place that serves it, or order it before hand. An atmosphere of contemplation, an emotional journey through time. We left in an excited mood after a supper which was given in our honor within the context of the festival. Under the watchful eye of the Mother Superior, who taught the rules of savoir vivre to her female students while they were having lunch around a large square table, we tasted some exquisite Tinian products and foods. Although you can’t dine there, make a stop at Loutra and visit the Museum of the convent, a magical place. Arrange for a tour ‒ it’s worth it just to see the rooms, the kitchen and kitchen tools of a bygone era. The chefs invited to the festival brought their own inspirations to the island. Among the ones I found particularly interesting were the louza ham dipped in chocolate by Yianna Balafoutis (owner of ceramics workshop Pyliaki Gi), and beef tongue with apple foam, a variation of a local tongue stew dish, by Alexander Kardasi from the Athenian Athiri restaurant. The gourmet take on lamb with artichoke fricassee was delicious, a creation by Yiannis Gavala from Mykonos, the sushi lahanodolmades (stuffed cabbage leaves) by Renos Arathymou (a playful take on the original) and the chard truffles by Eleni Saviolaki an interesting, creative variation on the local, sweet fesklopitakia pies (with chard, raisins, nuts, rice and spices). Many more dishes were created for the sake of the festival by local and non-local chefs, to find a place in the gastronomic legacy of the island. I left Tinos feeling complete. The locals completely won us over. Over 100 people in black T-shirts dominated the island and made sure that the event was a great success. They were all volunteers and did a wonderful job. If you think salt is what adds flavor to food, think again. The best ingredient according to Tinos Food Paths, is good company. The invitation made it clear: “You are our best ingredient”, and the point was made by writing it backwards, so that you had to hold it up to a mirror to read the text. Got the message? • Local fruits and vegetables can be found daily in the small market at the harbor entrance of Tinos Town. • In the organic markets of Athens, the farmer Fabianos Rouggeri sources delicious Tinian artichokes and other products of the island. • For cold cuts, try Yiannis Kritikou (+30 22830.29.280). In Athens: Arapian, Ellinika Kaloudia, Pandaisia, Alexandris. • For dairy products, the Tinos Dairy Cooperative, (+30 22830.21.184), and Patiriou, Megaloharis Avenue (+30 22830.23.289). In Athens, dairy products from Tinos can be found in large supermarkets.